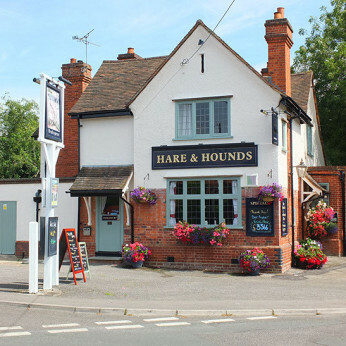 The Hare and Hounds is a traditional, family-friendly village pub situated in the heart of Sonning Common in the Chiltern Hills. There are two bars both with open fires and a relaxed atmosphere. The pub also has an large, attractive garden complete with a range of children's play equipment. There is a heated smoking area and lots of space to relax in the fine weather. The Hare and Hounds serves Brakspear's Real Ales, ciders and lagers. We also have a range of wines, spirits and non-alcoholic lager and soft drinks.